Smartphone Boom Fuels A $1 Billion Fantasy Sports Industry : All Tech Considered Fantasy sports revenues will reach at least $1 billion this year, and the growth is in lockstep with widening broadband access and the smartphone boom. 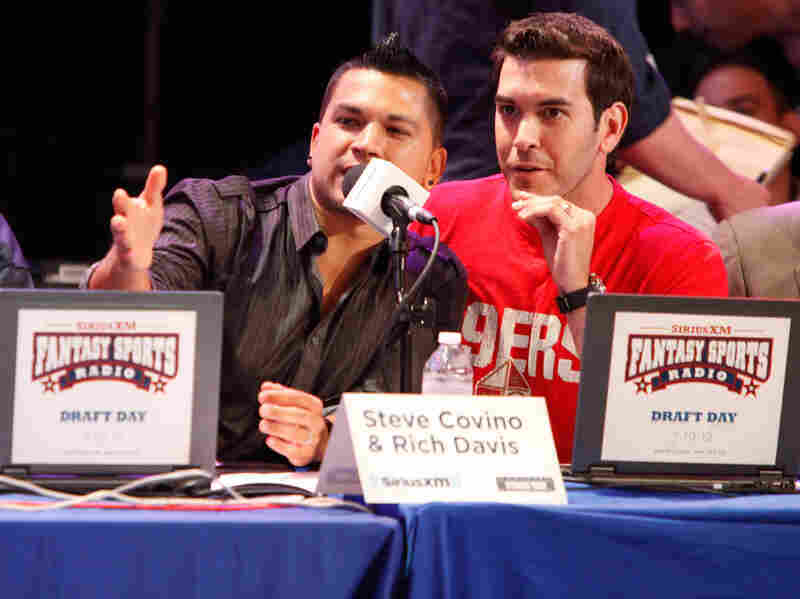 Steve Covino and Rich Davis attend Sirius XM's Annual Celebrity Fantasy Football Draft in New York in 2012. The whole beauty of fantasy sports is that you can manage teams of pro athletes without ever leaving your couch. The process of drafting teams, betting on the success of individual players and trash-talking with your similarly obsessed friends takes place on Web and mobile platforms, and that makes the fantasy sports pastime about more than just bragging rights. It's become a billion-dollar business. The analysts at IBISWorld forecast fantasy sports will bring in $1.2 billion in 2013, representing a threefold growth since 2004. The Fantasy Sports Trade Association says 33 million Americans take part in one fantasy sport or another — and 24 million of them play fantasy football. The growth in popularity tracks closely with the expansion of broadband access and the smartphone boom across the country. In fact, according to the latest numbers from the Pew Internet and American Life Project, about 63 percent of American adults now use their cellphones to go online, and 21 percent do their online browsing exclusively on mobile devices. That's a great trend for the main fantasy sports platforms. According to IBISWorld, Yahoo leads among fantasy platforms, with 11 percent of the market share, followed by ESPN and CBS. While managing teams on those platforms is usually free, exclusive content like scouting reports or instant tracking apps are not. But most of the money fueling the industry is from advertising and sponsorships, which are mostly targeted to the young male audience that plays fantasy. IBISWorld numbers indicate that only 1 in 10 women participate in fantasy sports. Good luck to your teams tonight as Pittsburgh plays Cincinnati. I'm hoping for a win tonight so not to go 0-2 in NPR's long-running fantasy league.